My friend (soon to be Harlequin author) Victoria Austin and I meet up at least once a year at a conference to learn, but mostly to hang. View from our room at the lodge. This year, we decided to take a brain break and just get together for a straight up writing retreat. We met in Cadiz, KY, which is a tiny little town in Southern Kentucky. 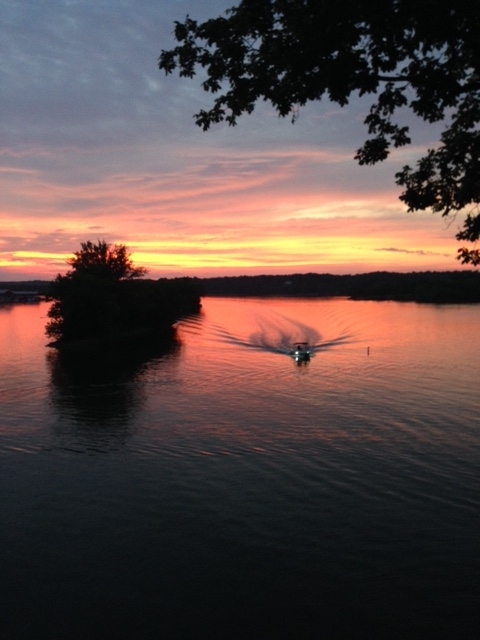 It’s home to Lake Barkley State Park, which is beautiful. We spent Friday night talking NONSTOP. We don’t talk a lot throughout the year, so when we get together, the floodgates open. 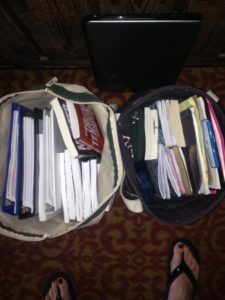 We’re both writing industry nerds to the max, so we get each other caught up on all the workshops we’ve done, the people we’ve met, the books we’ve read, and the progress we’ve made. We’re both hoarse by the time the weekend is over. Every time we meet up, I show up with a cooler full of drinks and food (made Pad Thai noodles this time! ), and my bags are packed with dark chocolate almonds, Chex Muddy Buddies, Cheez-Its, bagels, Kind bars, and anything else I can stuff in there. This is what Victoria packs (see photo to the left). She laid about eight craft books on my bed for me to “take a look at” and I hid under the bed with my dark chocolate almonds until she kindly removed them. We spent Saturday morning walking around the lake and chatting, and then we headed into town. We went down to the business district of Cadiz which was so precious. All around the town, they had these little pig statues. The Cracker Barrel we ate at even had one out front. I bought a shirt at the cutest little gift shop called Broadbents, and I bought a necklace at an antique shop that was made out of an old silver fork. The artist had molded it into an elephant. I wear it like every day. Much of the merchandise in these little shops is locally made and cute enough to make a road trip to check out. There are few things I love more than an adorable little country downtown. But I’ve got to say, one of the coolest moments happened before the weekend even got underway. I arrived first and went to get ice for my cooler in the main building. I had been to this lodge with my family once before when I was in the eighth grade. My sister didn’t come for some reason, so I brought a friend with me. She and I met these two boys who were from Lexington. We spent much of the weekend hanging out with those two boys at the pool and at the arcade in that main building where I went to get my ice. There were no romantic connections with these boys, but it was different, meeting boys who knew nothing about my awkward eighth grade year. They didn’t know about the boys who tortured me on the bus every single day of that year, and they didn’t see me like those kids who I’d been going to school with since kindergarten and knew all the ins and outs of my whole elementary and middle school history. Meeting these boys from another world was fresh and exciting and such an ego boost for a thirteen-year-old girl who desperately needed one that year. When I walked into that arcade, those memories rushed back into my brain like lake water spraying off a jet ski. I stood there by myself grinning like a total idiot, having a moment with thirteen-year-old Melissa that I won’t soon forget. In Romance, I typically read contemporary stories. But when I learned of D.B. 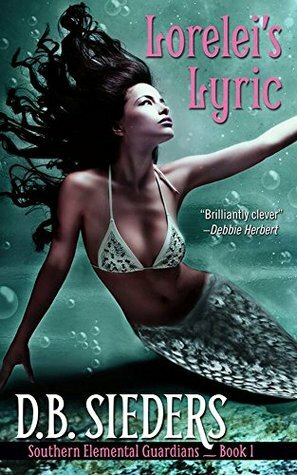 Sieders’ book about a mermaid who kills with her beautiful singing voice, I was hooked. The gorgeous cover didn’t hurt as well. Please welcome to the blog, author of Lorelei’s Lyric, D.B. Sieders! Tell us a little about yourself — who you are and what you write? Thanks so much for hosting me! 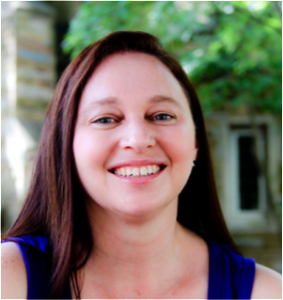 I’m a biomedical researcher by day, so I really enjoy exploring my creative side as a writer. My scientific life deals with logic, facts, and evidence. Exploring fantasy, myth, and legend when I use my writer brain serves as a nice balance. I mostly write fantasy/paranormal and urban fantasy romance and a bit of contemporary on the side. 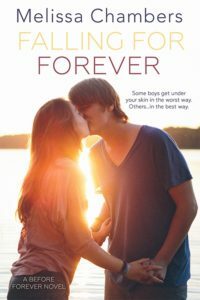 I tend to favor unlikely heroes and heroines who face a healthy dose of angst as they strive for redemption and a happily ever after, which everyone deserves. What kinds of research did you do into legends of mermaids and elemental creatures? I started with the Greek myth about Sirens. I had a rock star hero who, in spite of an amazing voice and the ability to seduce a crowd with his charisma, is about to give up on the eve of his big break. Who could challenge him, who would be most appalled by his path of self-destruction? Well, someone who wanted desperately to sing but can’t. Hence, the Siren. In spite of their association with mermaids in modern times, Greek Sirens were actually described as bird-like women, which left me with a bit of a problem (I’m a stickler for accuracy). I was still drawn to mermaids, mythical creatures with powers of both destruction and healing – a fascinating dichotomy! I stumbled on the legend of Lorelei, a siren-like enchantress from the Rhine whose beautiful voice lures sailors to their deaths by way of shipwreck. This legend, along with the legends of Melusine, the Warsaw Mermaid, Wagner’s Rhinemaidens, and the legend of Ondine, provided some rich source material. Vance is a rock musician and songwriter. Do you have a playlist for this book or a handful of songs that provided inspiration? One of my inspirations for Vance’s intensity, passion, and stage presence was Scott Weiland, who we sadly lost just last month. Adam Levine was another. Lorelei brings to mind Adele’s “Make You Feel My Love” when it comes to Vance. As far as other songs, I found inspiration from Patsy Cline’s “Walking After Midnight” to Santo & Johnny’s “Sleep Walk,” from Sting’s “Fields of Gold” to “What Might Have Been” by Little Texas. Lorelei is loyal and fiercely protective of those she loves, which is one of her best qualities. Her worst habit is that she’s way too hard on herself, especially when it comes to her past mistakes. Vance helps her come to terms with that. What authors or series of novels would you say your writing style is similar to? I definitely aspire to write characters the reader will root for, crisp dialogue, humor to balance all things emotionally heavy, and stories that will make you laugh/cry/think, often in the same chapter. I would love to reach J.R. Ward’s level when it comes to wounded, angsty heroes. I strive to capture the quirks and charm of the South like Charlaine Harris, and I would LOVE to be as funny as Darynda Jones someday! What celebrities would you cast in the roles of Vance and Lorelei? Oh, I could totally see Adam Levine as Vance, and Liv Tyler would be perfect as Lorelei! What is your writing process? Do you plot everything meticulously or do you dive in headfirst without a rope? Who are some of your favorite authors and what are you currently reading? Too many favorite authors to count! For paranormal/fantasy romance, some of my favorites include J.R. Ward, Jeaniene Frost, Darynda Jones, and Laurell K. Hamilton’s early Anita Blake books. 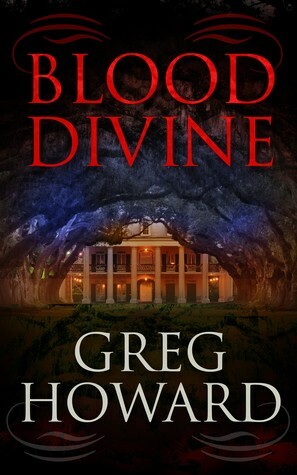 I also love Diana Rowland’s White Trash Zombie series and Lexi George’s Demon Hunting in the Deep South series. I’m currently beta reading an awesome Thriller and Paranormal Romance, and reading some great Sci-Fi from Jody Wallace and Contemporaries from Savannah Kade for promised reviews, which is always a treat! When will we get to see book two featuring Ilsa, Lorelei’s temperamental but good-natured sister? So glad you asked! Crosscurrents (Southern Elemental Guardians Book 2) will be coming out this spring. Here’s the working blurb: Freshwater mermaid Ilsa is heir apparent to the kingdom of the Rhine, though no one believes her worthy. Including Ilsa. So instead of embracing her role as river royalty, Ilsa opts to extend her holiday in the New World. Avoiding responsibility and frolicking with mortals has always been her M.O. until she answers a distress call from an endangered species in the waters near Chattanooga. When her close encounter with a motorboat threatens to expose the world of elemental guardians, Ilsa partners with biologist and unlikely ally, Paul Pulaski, to throw them off her tail. Worlds collide and sparks ignite between Princess Ilsa and her diamond-in-the-rough skeptical scientist, Paul. But can they survive monster hunters, a rival scientist with a grudge against Paul, and a dark elemental force that could destroy mortal and elemental alike? Is there anything else you’d like us to know about LORELEI’S LYRIC? Howdy readers! Looking for some unconventional fantasy romance featuring strong heroines and the heroes who strive to match them? Please come visit the world of Southern Elemental Guardians! I want to take readers on adventures in fantastical worlds hidden in the nooks and crannies of our reality, where heroes and heroines face extraordinary circumstances and find out what they’re made of. D.B. Sieders was born and raised in East Tennessee and spent her childhood hiking in the Great Smoky Mountains, wading barefoot in creeks, and chasing salamanders, fish, and frogs. Her family loved to tell stories while sitting around the campfire. Those days of frog chasing sparked an interest in biology. She’s a working scientist by day, but she never lost her love of telling stories. Now, she is a purveyor of unconventional fantasy romance featuring strong heroines and the heroes who strive to match them. Her characters face a healthy dose of angst as they work for redemption and a happily ever after, which everyone deserves. 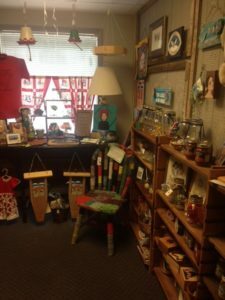 She lives in Nashville, Tennessee with her husband, two children, three cats, and her very active imagination. Lorelei’s Lyrics is available on Amazon. Greetings and salutations from Atlanta, GA! 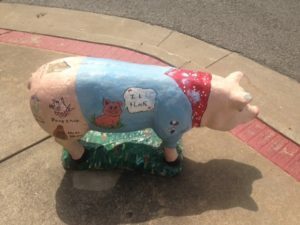 Thursday, I grabbed one of my writerly besties and headed even farther South for the Georgia Romance Writers Moonlight and Magnolias conference. The long weekend has been full of workshops, plotting new stories, making new friends, eating (so much eating), chocolate (so much chocolate), and finishing edits on another book. To say it’s been productive is to say Melissa sort of likes Ben and Jerry’s New York Super Fudge Chunk. Among the events of this fabulous weekend was a two hour long class with Candace Havens – Fast Draft and Revision Hell. Basically, we learned how to write a book in two weeks and revise in the next two weeks. I plan to put my money where my keyboard is and do this thing. 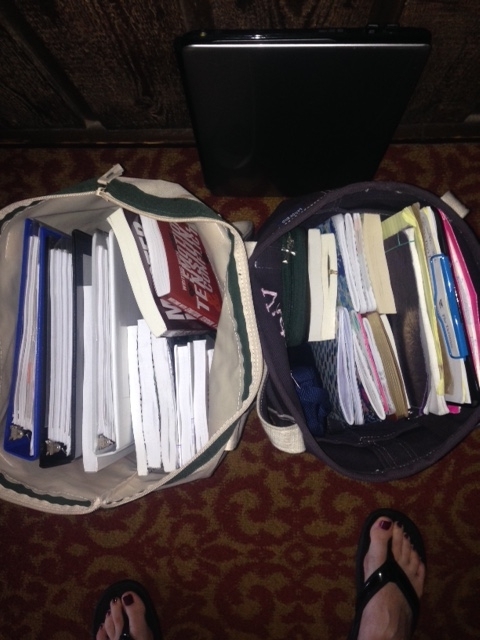 I’m taking a week to get some contest judging and beta reading done for a friend (I’m getting to you, K! ), but starting next Monday, it’s on. Note: If you see me rocking back and forth in a corner mumbling incoherently any time in the next month, please don’t be concerned. It’s all just a typical part of the writing process.